For many reasons, West Hartford (WeHa) is an ideal place to own a dog. Reason being? Its abundance of wonderful dog walking places. 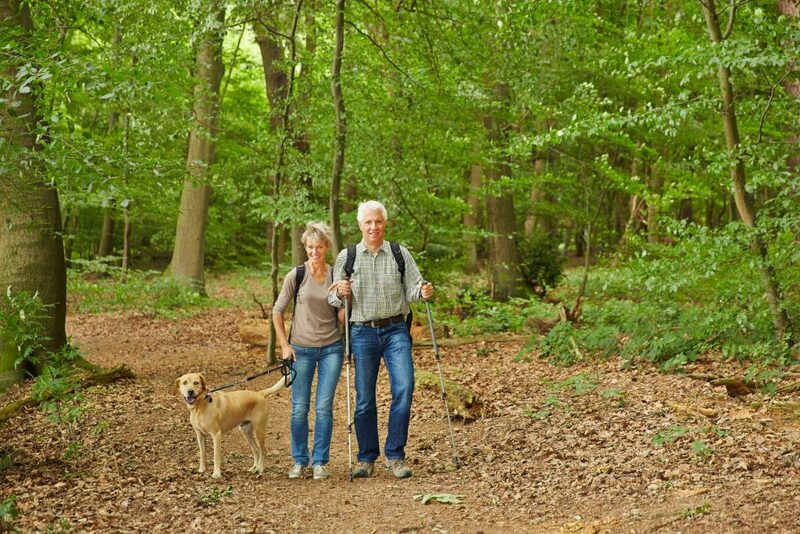 Here, dogs can experience all types of walks. 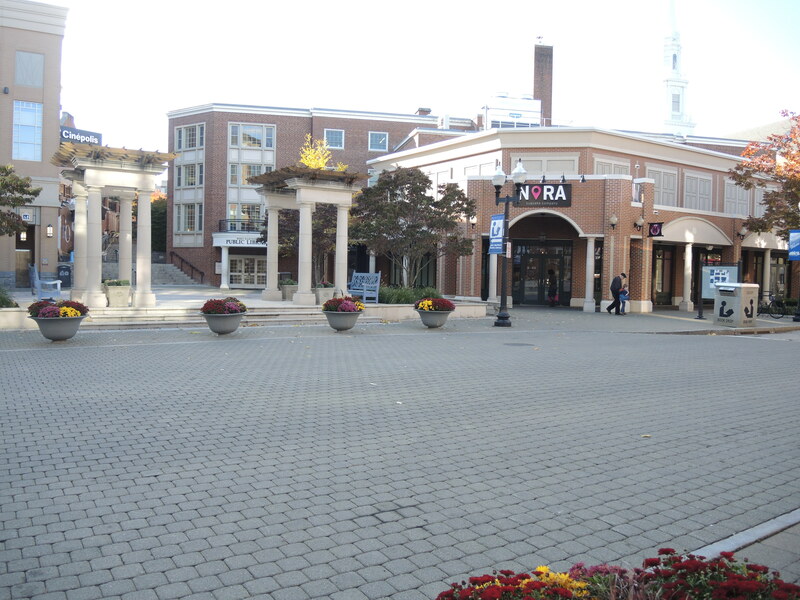 In and around WeHa there are places that can make your wagging friend feel like a city, suburban, or a even a country dog! 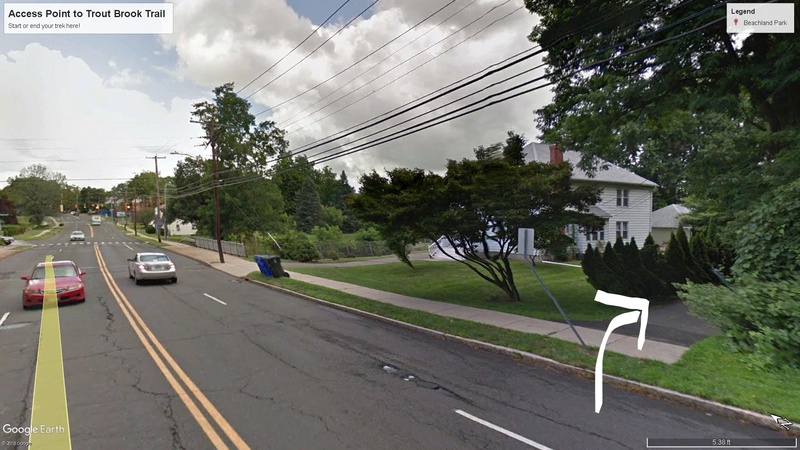 The famous 14,000+ member Facebook group called Neighbors and Friends in West Hartford was asked where their favorite places were to walk their dog. We polled our staff and did some research too. 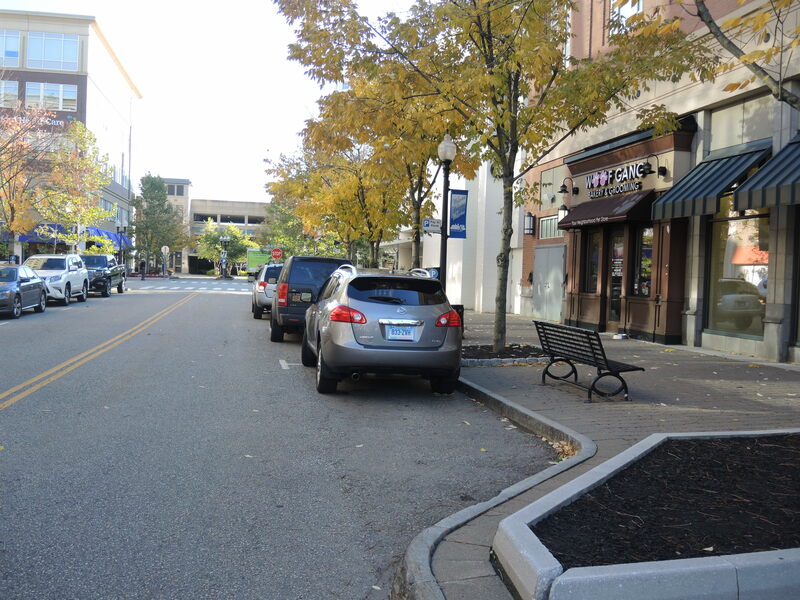 Now we are pleased to provide you with our list of West Hartford’s favorite places to walk your dog. Throughout the article, we added three superlatives for fun: Staff’s Pick, WeHa’s Most Popular, and Honorable Mention. When we polled our staff, our favorite walking route is this secluded trail that eventually leads to the Reservoir. It starts as a paved path, possibly a half mile or so. Once you’ve reached the end of the initial path, you’ll arrive at a fence. Go through the fence, walk a bit more and on your right will be a small foot-made path that leads you directly to the paved road loop. This loops around the entire Reservoir #5. It’s breathtaking. The trail is the unmarked white line that looks like a road and travels parallel to Squirell Hill Rd. toward the Reservoir. Go down the main path, then through a gate that brings you to the Reservoir’s property. 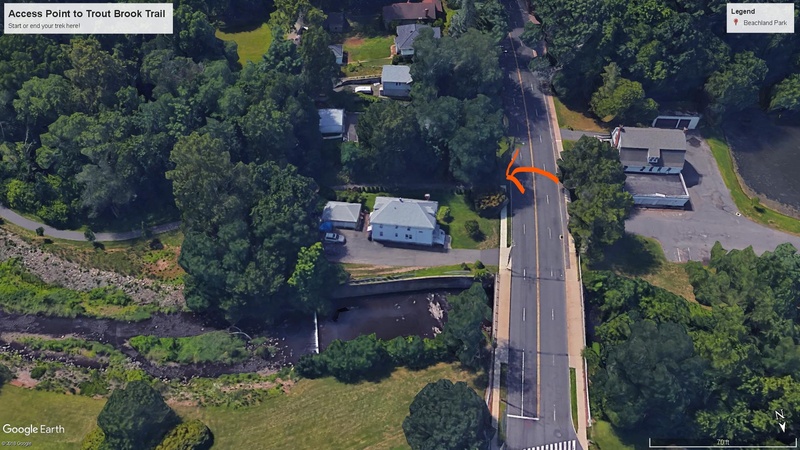 At that point, walk a little further, then turn right down a little path toward Reservoir #5 and it’s paved path. Our Staff Pick favorite walking trail offers more than you’d think. Extra trails, beautiful wildlife, etc. The more you frequent this dog walk destination, the more you’ll discover each time you’re there. Wolcott Park in West Hartford is a great place to walk your dog. When we asked, the Facebook group their favorite places to walk a dog, this came up more times than we expected it to. 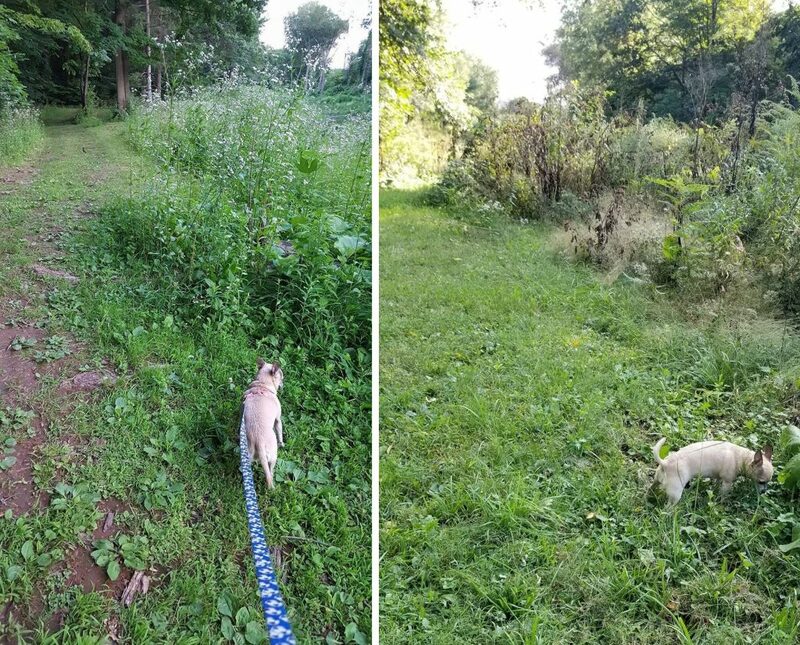 Erin Buckmiller of West Hartford told us, “Our puppy loves the few trails behind Wolcott Park!” . Erin’s puppy, Maddie, is a-sniffin at Wolcott Park! Here is Tanya’s dog Bella taking in all the smells during her nature walk. There is public parking right attached to the park’s entrance. The main attraction, a 3-mile path begins in the parking lot. 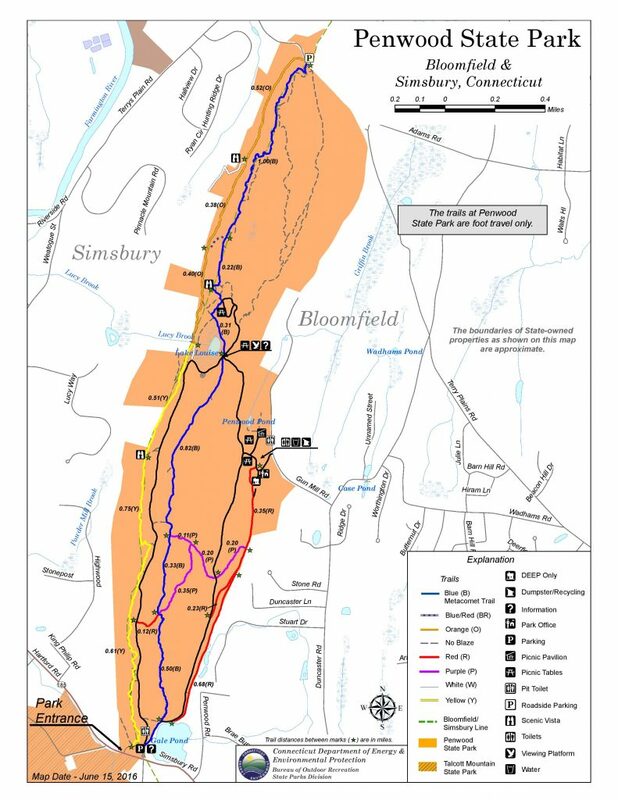 You can also take the Metacomet Trail instead of the main loop, which will provide you with more of a forested and secluded walk through Penwood Park. To access the start of this trail section, as you approach the 3-mile loop take a right and follow the path for a moment. You’ll quickly find a path that cuts off into the middle of the loop on the right. Take that path and it will bring you to the opposite end of the loop. It takes around 20-30 minutes (more or less) depending on your speed. At the end of this section, you’ll arrive to the ~halfway point of the trail on the other end. You now have four options. You can go back the way you came, take a left, or take a right to get back to the parking lot. Your fourth option is to continue straight on the Metacomet Trail which will take you to Southern New Hampshire. Don’t forget to bring the water and doggy treats for that hike! Going left on the trail, you can look for some paths that will lead you to magnificent views and depending on where you look, you’ll see neighboring Hublein Tower (south-west). In the map image above the trails will be on the yellow marked trail. 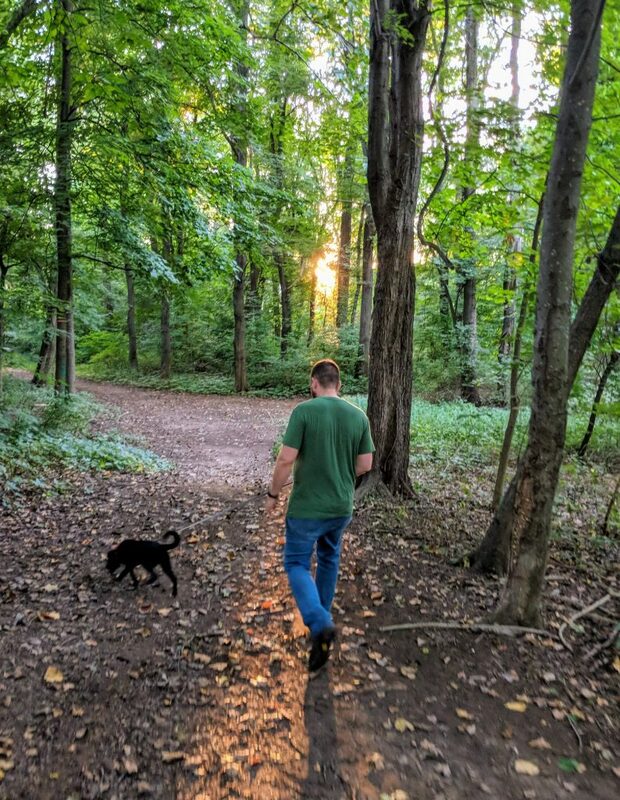 It may take a few times to get used to the park, but eventually you and and your four legged friend will find the best views and little trails. Around these parts, Talcott Mountain State park is synonymous with Hublein Tower; we use it interchangeably. Generally, the dog hike’s goal is to climb Talcott Mountain and Reach the top – where you’ll find Hublein Tower. Below we will tell you a few things about this park including parking, different trails, etc. 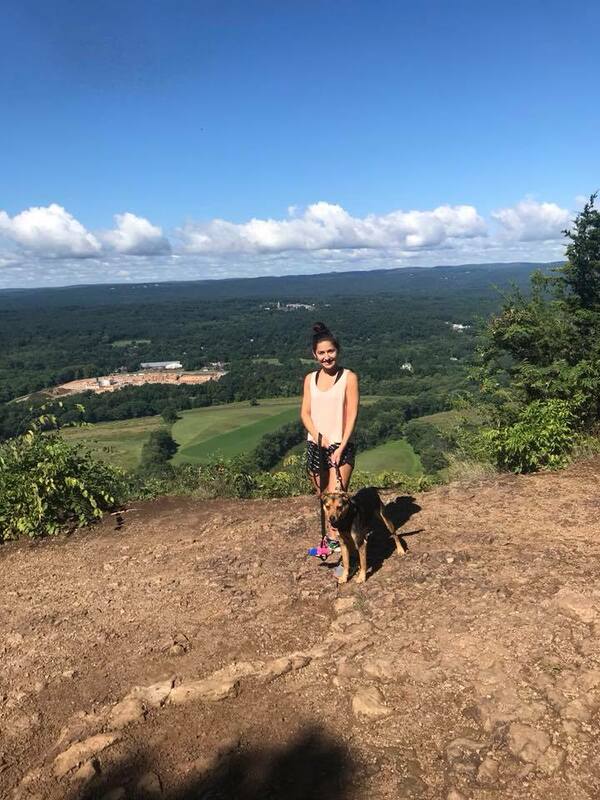 Here is Jennifer and her pup, Lucy, taking in the views on their way up to Talcott Mountain. If your dog is highly athletic and extremely well behaved around dangerous roads, this might be the dog walk for you. This way of trekking up the mountain is for adventure seekers who are looking for a killer workout and have 2-4 hours to kill. The very beginning of the Hublein Parking Lot’s Driveway is the safest option. Then you’d walk down a little way to access the trail across from Penwood. The less safe option (a little more direct) is parking in Penwood’s lot and crossing the street. If you select this option, please do so at your own risk. The road is windy, dangerous, and before you reach grass on the other side of the road, there’s a road barrier you’ll both have to step over. Using the Matacomet Trail to hike to the tower is a wonderful experience. You and your pup will still get a nice view, it’ll just take a little longer to get to it compared to the Main Trail. Taking a hike such as the Metacomet Trail poses some health and safety risks due to its remote and wildlife nature. Be sure to follow the blue diamond markings on the trees all the way up to the Tower. If you are going to let your dog off leash, bring a small leash just in case. En route to Hublein there may be dangerous cliffs and atop the mountain you may encounter children, misbehaving dogs, etc! Please be advised David’s Pet Services does not recommend you go offleash as it is dangerous and may be illegal (steep fines). Proceed at your own risk! Before you embark on this hike tell someone to expect to hear from once you’re back to your car, safe and sound. Take a fully charged cell phone to help you in case you get lost. West Hartford residents are so grateful for their Reservoirs. 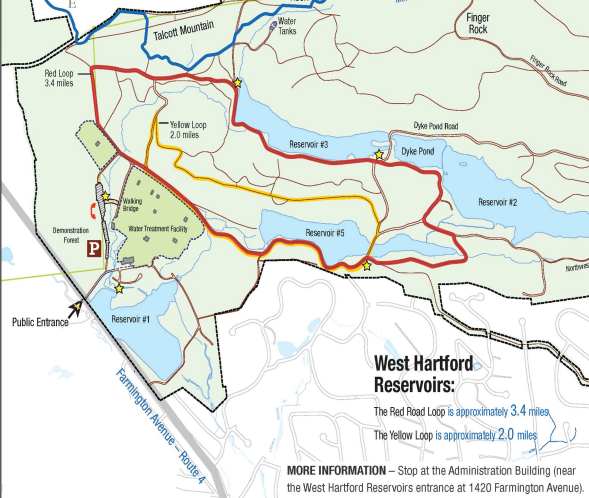 The MDC website says that the West Hartford Reservoirs and Reservoir 6 have five reservoirs and over 3,000 acres containing “some of the most beautiful woodlands and trails in the region”(“West Hartford Reservoirs and Reservoir 6″, 2014). 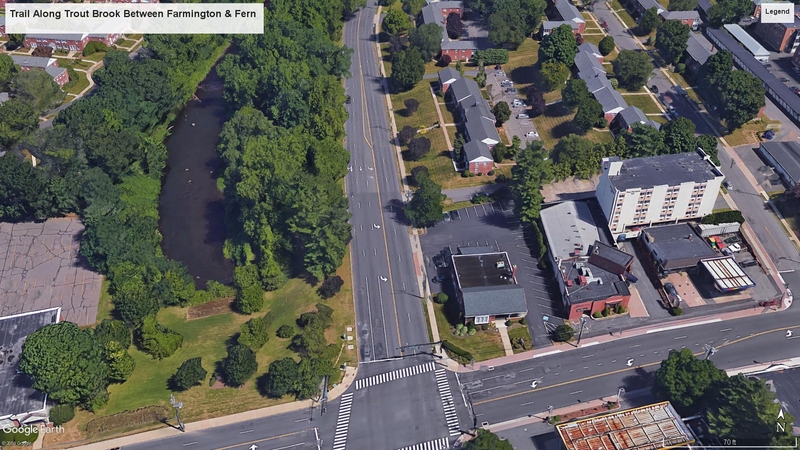 The main public access to these Reservoirs is off Route 4 (AKA Farmington Avenue) near the border of West Hartford and Farmington. Here you’ll find free public parking then you can walk to the Red Road Loop, approximately 3.4 miles, or the Yellow Loop, which is approximately 2.0 miles. Reservoir #5 is technically the main attraction here; the Red and Yellow loops go around it. This reservoir was everyone’s favorite when we asked our West Hartford friends on Facebook. You can access the reservoir by parking in the lot located off of Route 44 (AKA Avon Mountain & Albany Avenue) in West Hartford. Going toward Avon, it’ll be on your right. If you went over the Avon Mountain, you’ve gone too far – turn around! Here, you can park and access the Red Loop, approximately 3.6 miles long or the Yellow Paved Portion, which is a trail 1.4 miles one way (2.8 miles back and forth). 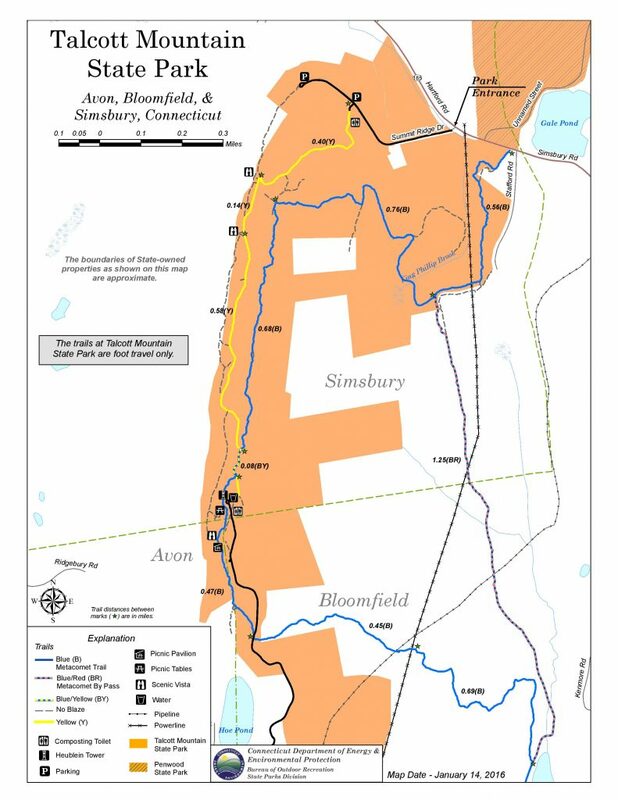 Further, from the Red Loop you can access the Metacomet Trail that, as touched on earlier, is a 114 mile trail that goes from Southern CT to Southern New Hampshire. once in while to compare to the normal suburban street walkin’. If you want your dog to feel like a city dog, this is the best place for you to take her! Lots of hustle and bustle can always be found in this area. You’ll fine lots of crosswalks, friendly people, and other friendly dogs to walk by. You don’t have to walk too far to find places for your four legged friend to go potty either. Also, for the humans, it’s nice to feel like you’re in a city once in while to compare to the normal suburban street walkin’. There you have it, a list of 10 different West Hartford dog walking routes that will really mix it up for your pup. With each journey, you can find a different experience each time. So what are you waiting for? Get out there! Woof woof!